More than half of the people globally will access the Internet first time from their mobiles. 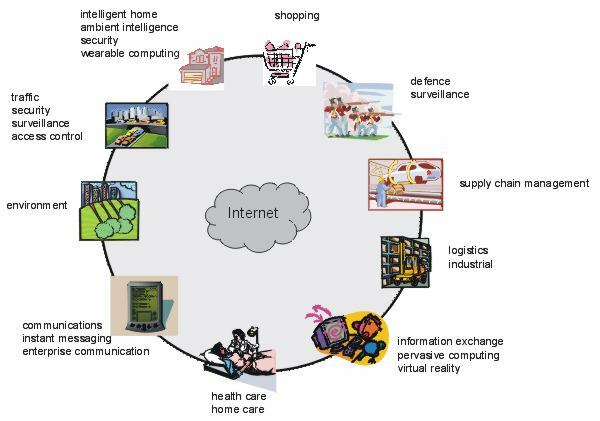 Applications will lead the way to Internet acceptability by enabling task/purpose specific content and traffic. Here’s my compilation of things that will lead the increasing Mobile VAS/Mobile Internet acceptance. A few of these applications such as Mobile money transfer, Mobile Healthcare, Education Classes through Mobile will be ground breaking in scope and scale. This list is a good reckoner and starting material to understanding how mobile VAS applications would alter the way of lives for billions. CMOs and CTOs could use this list as a check list to check whether their offerings are close or relevant to this glossary. John (35) is a middle manager in a large corporate. 2 years back, John was diagnosed to be diabetic and he has to visit his physician every Wednesday for a weekly blood check. It is difficult keeping up with the time, manage office and traffic and more. Fortunately, John uses this new application on his mobile phone wherein he sends weekly blood tests data to the computer of his physician. He gets the blood tests done through his glucometer, feeds in the data to his smartphone and sends it over to his physician who does the regular data checks and advises on course of action/course correction. This way John has reduced his monthly visits to the physician to 1-2 per month instead of 4 per month. Bollywood, Astrology, Cricket and Devotion are the growth engines of mobile VAS industry. However, I strongly believe that value to the consumer will not be so much from the A-B-C-D of mobile VAS as much from the more relevant services, like education and healthcare. It may be due to lack of spectrum for large volume data transfers of legal implications of distance health monitoring, Mobile Healthcare is a nascent market in India. This in spite of the fact that most of the time, people consult their family physicians over phone and get the diagnosis done telephonically. According to a recent report from Juniper, revenues from remote patient monitoring using mobile networks will rise to almost $1.9 billion globally by 2014, with heart based monitoring in the US accounting for the bulk of early mobile monitoring roll-outs. The Mobile healthcare market also includes health and fitness mobile applications that will thrive and eventually spawn a new market for advanced apps which integrate sensors worn on the body. So what’s next on the horizon? How about Health care MVNE? A Fortis Healthcare Connection within an Airtel connection that gives the users (mostly Fortis patients) the ability to connect with their doctors on a call. Whats the number of such an MVNE? Well… just estimate the number of Heart patients and diabetics in India…. Mobile Internet is the next big thing in India going by recent reports by Google. Indians have emerged as the second biggest consumers of mobile internet with 5.9% share of 14 billion mobile page views. Though the report may be majorly flawed because Google has not measured the China numbers, the statistic is quite telling in favor of India. The reported transition to the “fourth screen”, i.e Mobiles is well and truly happening as the number of new data connections added globally this year will be higher on the mobile than on the PC. The rise in the numbers of mobile internet in India is fueled by both post paid data accounts (numbers 25 million of the 500 million or so mobile users in India) and another 55-65 million pre-paid users who use the operator WAP portals to access the Internet. Thats about 13% of the total subscription base* of India.The number of Internet users on PCs in India is growing at 50% per annum and would hit the 100 million mark by the end of 2010. In Comparison China added 100 million new users to the online community last year. 2. The iPhone, the Rs 30,000 handset from Apple that accounted for nearly 40% of the global mobile web traffic in February, did not figure in the top 10 devices in India. 3. 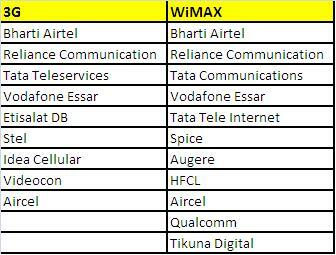 Nokia, which had just one presence in the world top 10 devices for mobile Internet, took all the 10 spots in India. Its devices also accounted for 59% of all mobile web traffic from India, followed by ‘Others’ and Sony Ericsson and Samsung. 4. 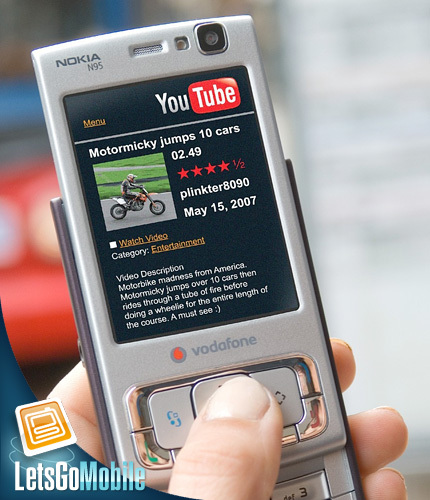 Nokia’s N70, the only Nokia presence in world’s top 10 devices for generating mobile Internet traffic, was the most popular ‘smartphone’ in India, followed by other N Series devices such as N80, N73, N72 and the iPhone. This thus re-iterates my view on the Indian Markets that low cost innovation would drive adoption in Indian Markets. The Indian markets have not seen any effort to reduce the cost of ownership of smartphones which has thus been an entry barrier to mass adoption of smartphones. The voice network congestion, high data tariffs and low penetration of VAS services (compounding by lack of compelling apps and VAS) have been stumbling blocks to mass adoption of internet on Mobile. Regulatory clearances and 3G roll outs will help massification of the mobiel internet. In the mean time, Indian markets have crossed the 600 million subscriber mark. The last 100 million subscribers came in a record of 3 months. Over 2 and a half years after it was originally announced the 3G and BWA auctions finally seem to be underway with the March 19th deadline of bids of 3G and the March 21st bids of BWA spectrum being invited. The reserve price for pan-India 3G spectrum is Rs 3,500 crore and for the BWA auctions, the reserve price is Rs 1,750 crore. 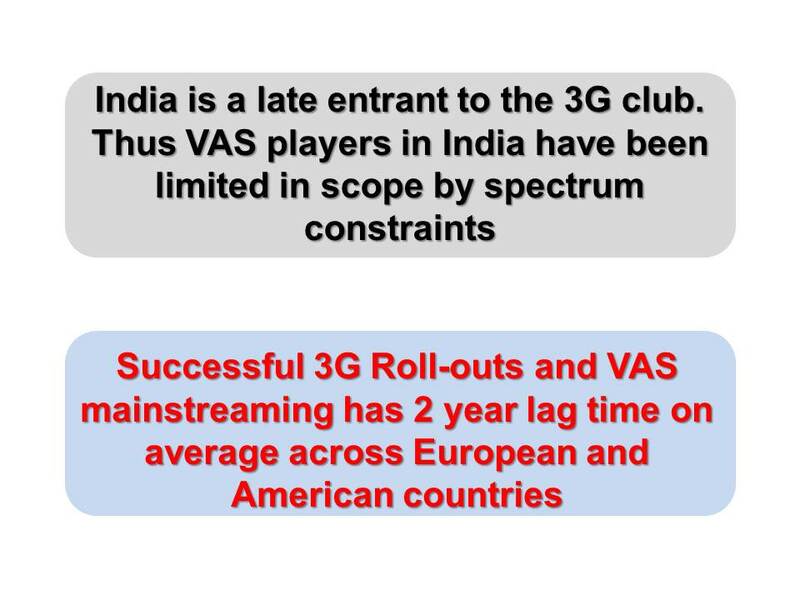 Predictably, the 3G auctions have attracted the existing 2G players with not even a single entrant:global or Indian in the list.The absence of global bidders is likely to ensure that the bidding will be conservative, and probably lower than the ambitious Rs 40,000 crore revenue target first announced by telecom minister A Raja. The BWA list has four new players — Augere, Tikona Wireless, Infotel Broadband Services and Qualcomm — while Spice is making a comeback into the telecom space. However, the data revenue growth in the near term is not expected to be robust enough to justify extravagant bidding by the players. Given the absence of foreign players and an uncertain return mathematics, the mechanics of aggressive bidding will not be a part of the process. The positive to all this is that Mobile VAS companies and the apps developer comunity in India which has been in an impoverished state for long, will find sudden traction given that all and most of these companies will try to maximize on revenues from the data stream. Airtel has sshown the way with 2.5 million downlaods of its Apps from its month old Apps store. Monetizing VAS downloads is going to be a different thing altogether. There are those like MTS, Uninor and others who havent bid for 3G. Going forward there would a question of the seriousness of their efforts and commitment to the Indian Markets. We will watch the play here. In an earlier post, i had spoken about opportunities, challenges and work that has been done on Indic Language SMS i.e SMS/MVAS in 22 Indian languages. The rubber looks to hit the road by mid 2010 and this post in my slide share account is a detailed report of the Indic Language SMS and the telecom eco-system.